Enjoy the festive atmosphere of Historic Valhalla Grand Hall with an elegant evening of champagne, hors d’ouevres, fine wines and catered dinner at the annual Valhalla Holiday Gala Diner. Each ticket includes a personalized Tahoe Silverwood handcrafted Bear Ornament, and you’ll also enjoy a silent auction before the end of the evening. Evening attire is recommended. Valet parking available on-site. It’s that time of year again! If you like to kick-off the holiday season with Holiday Tree Lightings, then you are in for a treat with the local festivites in North Lake Tahoe this December. Be sure to bundle up the little ones and get ready for a heart and belly-warming time! 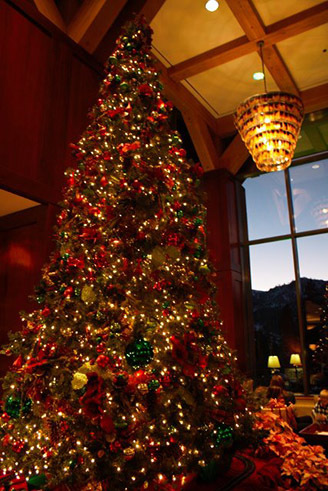 Join Santa and Mrs. Claus for the Holiday Tree Lighting Ceremony at the North Tahoe Event Center from 5-7pm. The annual community event includes photographs with Santa, a cookie swap and craft stations for the kids. 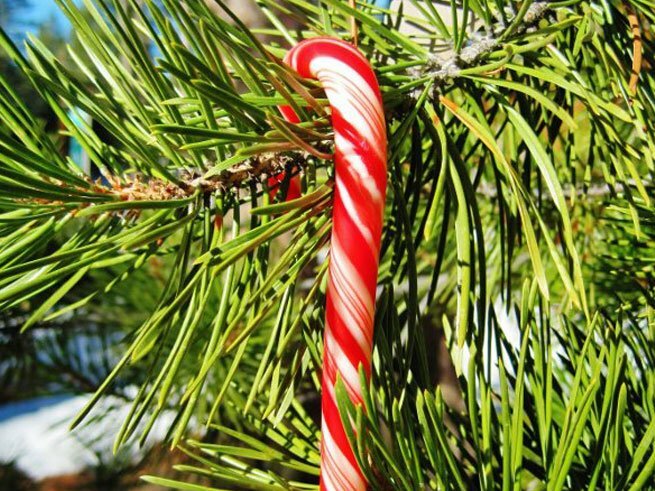 Warm up with hot cocoa and homemade soup and treat one another to candy canes. This event is sponsored by the North Tahoe PUD and the Event Center, the North Tahoe Business Association, and the Boys & Girls Club of North Lake Tahoe. For further details, call 530.546.9000. Help Santa Claus and Liberty Energy turn on the holiday lights in Downtown Tahoe City from 5PM to 7PM. Warm up with friends by the fire in Heritage Plaza with complimentary refreshments and enjoy live holiday music. Carol with friends and loved ones to ring in the holiday season! This event is sponsored by Tahoe City Downtown Association and Tahoe City Public Utility District. For more information visit The Tahoe City Downtown Association. Join Santa Claus in Cal Neva’s beautiful Indian Room to light the Holiday Tree from 5PM-7PM. Get your photo taken with Santa himself, and snack on warm cookies and hot cocoa. For more information visit the Cal Neva Resort. Snow, steaming hot cocoa and sleigh rides. There is so much happening this year at the 7th Annual Magical Memories, we don’t know where to begin! Resort at Squaw Creek has crafted a bevy of holiday activities for all ages, which runs from November 25, 2011 to January 8, 2012. We’ll just whet your appetite for winter wonderland galore with these options: holiday caroling, cookie decorating, wine and cheese tastings, s’mores roast and hot cocoa by the bonfire, breakfast with Santa, stories with Mrs. Claus in the lobby, snowman making competition, sleigh rides and more! To see a detailed list of events by date and more information, click here! If you are music buff, then be sure to set aside these dates and get your ticket while you can! Handel’s “Messiah” in the Grand Sierra Ballroom is a local’s favorite, and not one to miss. 11/30, 12/7, 12/14 at 5 PM: Live Local School Performances. Complimentary! 12/10 and 12/11: The Truckee Tahoe Community Chorus of Sierra College presents “Sing Christmas”; for tickets click here. 12/16: The Orchestra and Community Chorus of the Tahoe Area (TOCCATA) presents a special version of Handel’s “Messiah” in the Grand Sierra Ballroom. Buy your tickets here! Coldwell Banker Select Real Estate and the United States Marine Corps Reserve are proud to sponsor the 32nd Annual Toys for Tots Party on Wednesday, December 7th from 6-9 p.m in Incline Village. This year’s event kicks off at The Chateau Incline Village and features music by DJ Alex “Boogie” Smith, dancing, cocktails, delectable appetizers, prizes and an appearance by Santa Claus himself! The mission of the U. S. Marine Corps Reserve Toys for Tots Program is to collect new, unwrapped toys during October, November and December each year, and distribute those toys as Christmas gifts to needy children in the community in which the campaign is conducted. It is a crucial fundraiser during the holiday season, and the community support allows children in need to have a joyous experience at Christmas. For women who list “be a better skier” and “build confidence” to their New Year’s Resolutions, Ingrid Backstrom and Jessica Sobolowski-Quinn are hosting the ultimate women’s weekend ski camp aimed at accomplishing both of those goals. The camp will also showcase world famous Squaw Valley and help women feel more comfortable skiing the entire mountain. The camp is open to expert skiers, ages 13 and up. Campers receive unparalleled coaching from the world’s top women big mountain skiers. A videographer films each participant during Saturday’s session so women can gain a visual perspective of their skiing strengths and weaknesses prior to heading out for day two. What: Unparalleled women’s ski clinic led by the world’s top women big mountain skiers. For women who want to improve their skiing and confidence on the mountain in a fun, pressure-free environment. Also available is video filming on the first day so women can gain a visual perspective of their skiing strengths and weaknesses prior to heading out for day two. Ingrid and Jessica are excited to team up with WOW (Women of Winter) and have one WOW instructor per group along with your big mountain coach. The WOW clinics are a great way to get ready for the Next Level Camp. Who: Next Level is limited to experts due to the goal of the camp. Please feel free to call or email about ability questions. When: January 7th and 8th, 2012. Where: On the slopes of Squaw Valley, with the ski-in/ski-out Squaw Valley Lodge as the host hotel for meeting area, yoga, breakfast / lunch and video analysis. 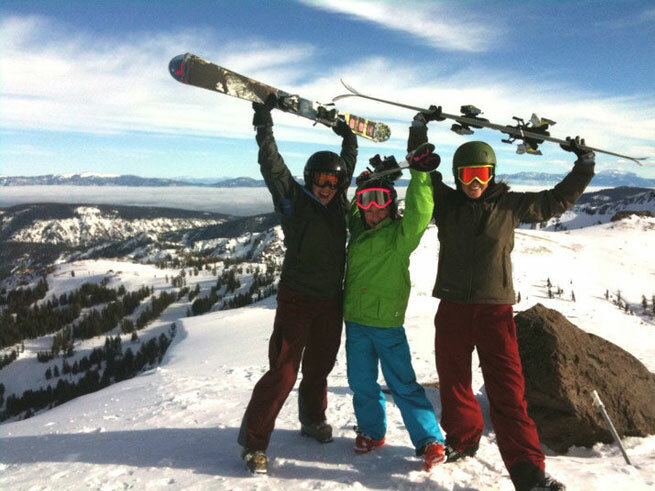 Special Next Level Clinic lodging rates are available at Squaw Valley Lodge. Group reservation details are below. Cost includes 1/2 hour morning yoga session Saturday and Sunday, breakfast, lunch, video, 6 ladies – 2 coach ratio and a gift bag and prizes from Columbia, Northface, Clif Bar, Zeal, Kombi, Volkl / Marker and Tecnica. Description of the day: We will meet at 7:30AM each morning. Sherry McConkey, once again, will have a morning yoga session that focuses on getting your mind and muscles ready for the day. Breakfast is served from 8:15-8:45AM. Groups will hit the hill at 9am – 12pm where we will take an hour for lunch. 1pm -4pm groups will meet again and ski until mountain closing. On Saturday, immediately following group skiing, Ingrid and Jessica will host the video analysis day with beverages and appetizers. Registration Information: Email Jessica @ jsstahoe@gmail.com for registration and pay instructions. Call 800.979.0486 and ask for the Next Level Women’s Clinic Special Rates. Email reservations@squawvalleylodge.com, and ask for the Next Level Women’s Ski Clinic Booking Code to receive group discounts. Enjoy the finest of amenities and services. Ingrid has podium in numerous freeskiing contests and filmed for various ski movies including 8 Matchstick Productions films. She climbed and skied Denali this past June as part of a team with The North Face, and after spending the past season traveling everywhere from Japan to Greenland to Chile, she looks forward to skiing KT more this season. Her coaching experience includes co-ed and women’s camps throughout the West and in South America for the past 7 years. Jessica Sobolowski-Quinn has been in over a dozen ski movies. Jessica has ton’s of first descents in the Chugach Mountain Range where she spends 3 months every spring guiding and running Points North. She is a mom to Kinley Drake Quinn and calls Squaw Valley her home. She hosts “Alaskan Ladies” at Points North Heli (PNH, www.alaskaheliski.com), which she owns and operates with her husband. How about a traditional Thanksgiving with a twist this year? Why not join the local community for a fabulous time of music, fun, food and friendship? Whip up for your favorite Thanksgiving dish to share with others, and join community members at the Inaugural Tahoe Community Thanksgiving Potluck Celebration. Volunteers are welcome! 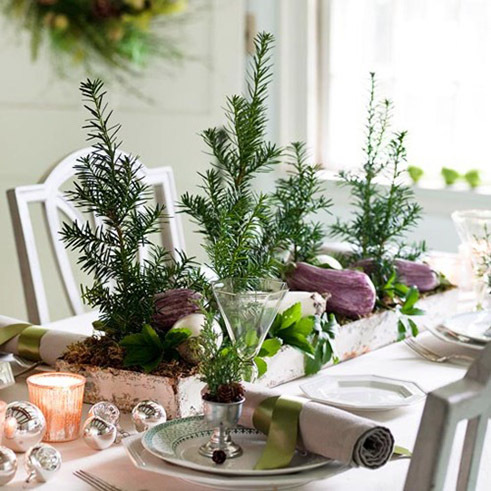 If you would like to help set-up and decorate, you are welcome to join others on Wednesday, November 23rd at 1pm. For more information, visit the Tahoe Community Thanksgiving Celebration blog! Cost: Complimentary! Bring your favorite Thanksgiving-inspired dish to share. 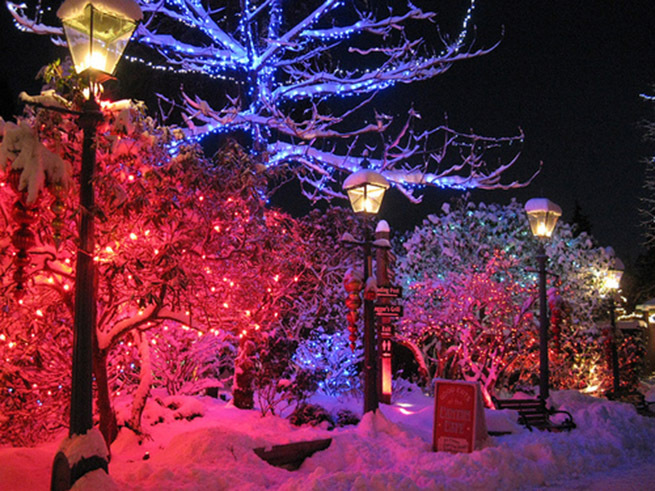 Light up your holiday season with the Town Tree Lighting! It’s that time of year again. Fresh snow, a cup of hot cocoa, letters to Santa, and festive lights to warm your hearts. Kick off the holiday season this December with the Tahoe City Holly-Days Jubilee! Bundle up, bring your camera, and come see Santa light the tree! Want a great photo to share in your holiday cards this year? Then grab the whole family and get your picture taken with Santa! All events are held in the center of town at the Heritage Plaza: 550 North Lake Blvd, Tahoe City, CA.